The Lemurian race was a combination of beings that came mainly from Sirius, Alpha Centauri, Pleiades, and a smaller number of them from other planets as well. Over time, as these races mixed together on Earth, they formed the Lemurian civilisation. This was the beginning of civilisation on this planet, which ultimately saw the dawning many other cultures such as Atlantis. The continent of Lemuria was ‘heaven on earth’ for a few million years. It existed in the Pacific Ocean, Hawaii, Easter Island and the Fiji Islands. Also, some parts of Madagascar were part of this ancient continent. At its peak, it even touched parts of British Columbia in Canada. It was one vast continent much larger than North America, connected to parts of California, Oregon, Nevada and Washington. The Lemurian Age took place approximately between the years 4,500,000 BC to about 12,000 years ago. Until the sinking of the continents of Lemuria and later on Atlantis. For a very long time before the fall in consciousness, the Lemurians lived in a fifth-dimensional frequency or dimension, and they were able to switch back and forth from fifth to third at will, without any problem. It could be done whenever it was desired, by intention and the energies of the heart. This large continent disappeared overnight into the Pacific Ocean over 12,000 years ago in a vast cataclysm. All inhabitants of the Earth at that time considered Lemuria, the land of Mu, their motherland, and there was much weeping on the Earth when that happened. Being totally aware of their own demise, the ancient Lemurian’s, using their mastery of energy, crystals, sound and vibrations, hollowed out a vast underground city, with the intention of preserving their culture, their treasures, and their records of ancient Earth’s history. This has been lost since the sinking of Atlantis. So the truth is that the Lemurian’s exist. They are well and physically alive, living in the subterranean city of “Telos” beneath Mount Shasta. 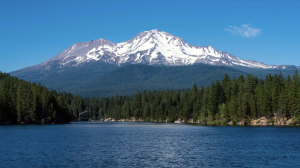 About 25,000 Lemurian’s at that time were able to migrate into the interior of Mount Shasta, the most important of their various administration centres, prior to the sinking of their Motherland. Also, during the fall of Lemuria, everyone was given a choice to either become a volunteer to help raise human consciousness back into 5D frequencies or to return to their own system of light or source. Mount Shasta is a surreal mountain, part of the Cascade Mountain Range, in Northern California. It is the cone of an extinct volcano rising to a height of over 14,000 feet above sea level and is one of the largest volcanic peaks in the continental United States. It is magical and is considered as one of the most sacred places on this planet. The mountain is a mystic power source for this planet. It is a focus for Angels, Spirit-guides, Spaceships, Masters from the Light Realm, and the home of the survivors of Ancient Lemuria, which sank under the waves of the Pacific Ocean a little over 12,000 years ago. They have preserved their ancient culture. The Lemurian’s living underground, beneath the mountain. There are a series of tunnels left by volcanoes that were under the earth like freeways — a world within a world. These caverns have been made bigger and more liveable. There are now one and one half million of them living there. They have developed a whole fleet of spaceships called the “Silver Fleet” with which they come in and out of the mountain and go out into space. They also have the ability to make their spaceships invisible and soundless to avoid being detected by the local and national military. Though they are third-dimensional people in nature, they are able to shift their energy field into the fourth and fifth dimension and become invisible at will within seconds. Many people report seeing strange lights on the mountain. One explanation is that there are spacecraft coming and going constantly from a spaceport deep within the mountain. Mount Shasta is not only a home for the Lemurian’s, but it is also an inter-planetary and inter-galactic multi-dimensional portal. There is a huge etheric city of Light above Mount Shasta called the Crystal City of the Seven Rays. At some point in our near future, hopefully within the next twelve to twenty years, this wondrous city of Light is destined to be lowered into our physical realm, and become the first city of Light to manifest tangibly on the surface of this planet. In order for this to happen, the people who live here will have to match this vibration in their consciousness. 11 Traits Of A Lemurian? Lemurian’s worked within the quantum field in which they discovered the pathway to a 5 Dimensional world. They also had the ability to move between 3rd, 4th and 5th dimension worlds. They had evolved their sixth-sense, which enabled them to communicate among themselves by extra-sensory perception and telepathy. They could also teleport and make themselves invisible at will. An ascended civilization living in a fifth-dimensional vibration and consciousness. Their knowledge was boundless. They carried out extraordinary ventures but all these stopped when they were captured by a volatile army during the downfall of Lemuria. Lemuria gave birth to Atlantis and other civilisations. There were conflicting ideologies with other cultures so extreme clashes occurred. They did not believe in forceful spiritual conversions. They believed that people should choose their own will about devotional beliefs whereas Atlantis believed that they should win others with force. Lemurians were devastated by a thermonuclear blast bringing about an age of darkness and malice. Lemurian’s were aligned to their higher selves, their IAM ness and their star families. They had exceptionally powerful gifts and understood energy and the way the universe works. They saw everyone as equals and existed within a state of oneness. Lemurian’s held powerful healing gifts. If you are a volunteer it is likely that you are remembering your gifts at this time. Whatever they were during the time of Lemuria is what you are waking up to again so that you can use them again and live your purpose. During the sinking of Lemuria people were given a choice to either become a volunteer to help raise human consciousness into higher states of awareness or to return to their own system of light or source. Those that chose to be a volunteer and experience the fall into 3D may not have understood how many lives they would need to live or the intensity and density of those lifetimes. 15000 years caught in the birth-death cycle. The downfall of Lemuria embeds itself in the genetics of the human soul. Healing it requires spiritual struggle of the highest form in several incarnations. Their mother tongue is the Lemurian language, but they also speak impeccable English with a slight British accent. They have chosen to learn English as a second language because they are situated in America. They are commonly described as graceful and tall – seven feet and up –with long, flowing hair. They dress in white robes and sandals, but they have also been seen in very colourful clothing. They are said to have long, slender necks and bodies, which they adorn with beautiful decorative collars made of beads or precious stones. The Lemurians supposedly have mastered atomic energy, telepathic and clairvoyant skills, electronics and science as long as 18,000 years ago. They have technology that makes us surface dwellers, look as toddlers compared to them. They control most of their technology with their mind. The Lemurian physical body does not age thanks to advanced hydroponic technology which enables them to exist on a diet of living foods. Because of this, many live for hundreds of years. Fact, Lemuria still exists to this day in a fourth and fifth-dimensional frequency, not yet visible to your third-dimensional vision and perception. As the veil between those dimensions continues to become increasingly thinner, Lemuria will reappear in a very physical and tangible way. Lemurians will rise again and carry the torch of spirituality with their heads held high. Many people await the fulfilment of this prophecy and the good news is that it has already started. We must vow to follow the path of love, light and spiritual enlightenment. Do you think you are a volunteer from Lemurian? Leave a few comments below to reveal what your golden gift is to the world?